Users of the Family Historian genealogy program will be pleased to know about version 6.1 that has just been released. Not only is this a free upgrade for version 6 users, it is also the largest free upgrade of the program for more than 10 years. 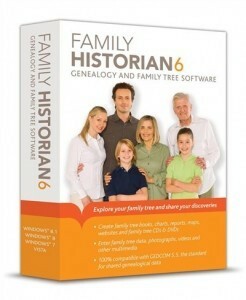 For full details of new features and enhancements, please see http://www.family-historian.co.uk/features/whats-new-in-version-6-1. – A new feature called Smart GEDCOM Loading has been added, which delivers big improvements in GEDCOM imports – especially from Family Tree Maker and Ancestry GEDCOM files. The same feature can even be used to recover hidden data in existing Family Historian projects that were previously created by imports from Family Tree Maker or Ancestry. – Improvements to direct import from The Master Genealogist and Genbox. – Much improved support for Source Citation media. – Numerous enhancements to support for witnesses (‘shared events’), including the ability to have multiple roles for witnesses and principals, and to effectively have ‘no-principal’ or ‘multi-principal’ events. – Improved support for generating sentences in narrative reports. You can now add source citations for parent-child relationships (birth or adoptive), as well as spouse relationships. – Tool to automatically find, and fix links to, missing pictures and other media files. – A new tool that can automatically take and store daily snapshots of your entire data file, so that you can easily revert to an earlier version if you need to (this is in addition to full multi-level undo/redo within each session). By default, only the 8 most recent snapshots are kept, to ensure that space taken by snapshots never becomes excessive. – Improved compatibility with companion products, including the option to save Family Historian data files in the popular UTF-8 format. All version 6.0 users are recommended to upgrade to 6.1. To do so, click Check for Updates on the Help menu, when running Family Historian, and follow the instructions. Alternatively, the upgrade can be downloaded from http://www.family-historian.co.uk/downloads/latest-free-upgrade. For users of The Master Genealogist (TMG) this is most certainly welcome news, as this update includes direct import of TMG files, rather than having to transfer files via GEDCOM. The CD version that we sell is Version 6. Once purchased and installed, you can then download version 6.1 upgrade for free.